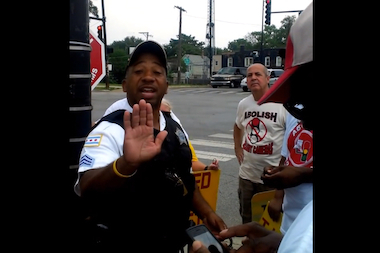 Citizens to Abolish Red Light Cameras posted a video online of a protest at 119th and Halsted streets recently that shows Chicago Police Sgt. Herbert Brown Jr. calling demonstrator's signs "slanderous" and then threatening to arrest at least one demonstrator. WEST PULLMAN — Activists against the city's red-light cameras are accusing the Chicago Police Department of trying to "bully" and "politically intimidate" them during a recent protest at 119th and Halsted streets. Citizens to Abolish Red Light Cameras posted a video online recently which shows a police sergeant calling protesters' signs blasting the camera program and local politicians "slanderous" and then threatening to arrest at least one demonstrator. According to group member Scott Davis, about 25 to 30 protesters were standing on the sidewalks at the four corners of the intersection holding signs and passing out fliers opposing red-light and speed cameras last month. One hand-lettered sign said, "Got Tickets? Blame Austin," referring to Ald. Carrie Austin, whose 34th Ward is where the intersection is located. Other signs called out Ald. Howard Brookins (21st), Ald. Anthony Beale (9th) and Mayor Rahm Emanuel. The group had selected the intersection because it was one of the many with cameras that showed sudden spikes in tickets that the city could not explain, according to a recent Tribune story. The city inspector general is reviewing the findings. About halfway through the three-hour protest, three police squad cars arrived, the protesters said. One officer, Sgt. Herbert Brown Jr., called the protesters over to one of the corners, they said. He then began speaking to the group, according to the video filmed by a protester and posted on YouTube. "Because all of these slanderous signs — you understand what I'm saying," Brown can be heard saying on the video. "That's not what we're about. This sign about Beales [sic], this sign about the mayor. You have to have a permit to do this." In the video Davis can be heard saying, "We have a permit — the U.S. Constitution." Around that time Brown takes his handcuffs off his belt and threatens Davis with arrest, asking loudly, "You want to go into the [police] station?" "I'm ready to go," Davis replies. Brown later says, "All I'm saying is there's a way to demonstrate, and then there is a way not to demonstrate." At about the midway through the video, Brown seemingly shifts gears, saying his real problem is with the demonstrators blocking the flow of traffic. "I just say don't interrupt the flow of traffic," he said. He even says he personally doesn't like the cameras, noting that his family has gotten tickets. "I don't want red-light cameras," he said. "But by the same token, I got to do my job." Protester Barnet Fagel denies they were impeding traffic. "We have volunteers who stand on the side of the road, and when traffic is stopped, they approach cars and give out fliers," said Fagel. "Never, never have we stopped cars from proceeding. It was the cop cars on the street impeding traffic — not us." No one was arrested during the protest, and the police left without any further confrontations. Police officials did not respond to multiple requests for comment. Officials with the police union said they would not comment unless a formal complaint is filed. Ald. Austin's office did not return calls. But after a week of media attention following the Tribune story, Davis said he doesn't think it's a coincidence that police paid their group a visit, saying it was an attempt to "bully" and "politically intimidate" them. "We've been demonstrating for two and a half years, and we've never had these problems with the police before," Davis said. "We support the Chicago Police Department and the difficult challenges they face in the city." Despite the confrontation, group members said they were emboldened by the incident. "I'm not discouraged by the police — I'm encouraged, I'm enthused. It means we're doing the right thing," said Fagel. "The city is getting concerned. They tried to do the Chicago thing — intimidation — but it backfired on them." On Saturday, the group will be at Northalsted Market Days, which runs on Halsted between Belmont and Addison. On Aug. 16, they head to the Gods on the Block Street Festival at 78th and Indiana Avenue.